The Hampton Inn Atlanta-Northlake hotel is located in Atlanta Georgia only 10 miles northeast of downtown Atlanta and nestled in the Northlake Office Park with easy access to major businesses and Interstate I-285 making the Hampton Inn Atlanta-Northlake hotel of Georgia the perfect location for any business and leisure traveler. You will enjoy all the amenities that you would expect to find at a Hampton Inn hotel in Georgia. We start your day off right with a deluxe free hot breakfast. 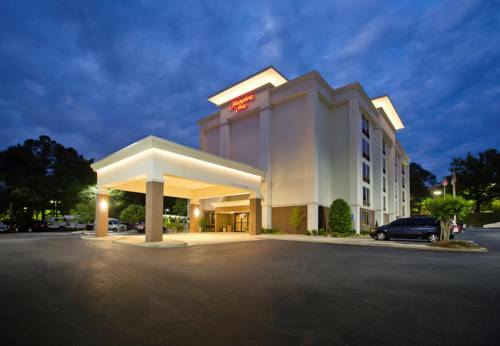 You will enjoy the convenience of a number of our Hampton Inn Atlanta-Northlake hotel free amenities such as wireless high-speed Internet access local phone calls and USA Today /Mon-Fri/. Additionally all of our hotel guest rooms are comfortably furnished with coffeemakers iron and ironing boards hairdryers voicemail services refrigerators microwaves and of course our 100 Hampton Guarantee. Hampton Inn Atlanta-Northlake hotel in Atlanta Georgia features 5-stories 121 hotel guest rooms and suites /85 non-smoking/ outdoor hotel pool fitness center /on site/ business center guest laundry 24-hour convenience shop and meeting space for up to 50 people. Amenities you will find at this Atlanta Georgia hotel include free continental breakfast and On Command TV with HBO. We also offer connecting rooms and cribs. Laundry/valet services meeting/banquet facilities and rollaway beds are available at our Hampton Inn Atlanta-Northlake hotel for a nominal fee. We love having you here at our Hampton Inn Atlanta-Northlake hotel in Georgia. ALL RESERVATIONS MUST BE CANCELLED by 11:59 PM the night before arrival HOST TIME UNLESS DEPOSIT REQUIRED IF THIS RESERVATION HAS BEEN MADE ELECTRONICALLY PLEASE CANCEL IT ELECTRONICALLY TO AVOID CONFUSION AND A NO SHOW BILL. POLICY SUBJECT TO CHANGE. Homestyle cooking featuring fried chicken succulent roast beef tasty fried shrimp all ready to enjoy.